I ignore the vibrating phone in my pocket as I chat with two friends. Thirty seconds later, I feel it again. I don’t want to interrupt the conversation, so I multi-task and pull it out while staying focused on what my friend is saying. A quick glance tells me its my husband, Jerry. I touch the ignore button and put the phone back in my pocket. (oh, don’t act shocked, you’ve done that already too) He calls most days when he’s eating lunch, usually just to chat, and he knows if I don’t answer right away, I’ll call as soon as I can. I steal another glance at the screen … Call from Jerry. “Where are you?” A soft voice asks. Jerry is a quiet person with a soft voice, but it usually has energy. Today it sounds weak. “When will you be done?” The same quiet voice asks. That sets the activities of the next few hours in motion. A twenty mile drive brings me to the house under construction with his truck parked out front. He gets into my car with a hand over his left eye. “Any better?” I ask wistfully. And me, “Miss No-Nurse” – the only help I offer is saying, “Which hospital do you want to go to?” Jerry does all he can to avoid emergency rooms, plus he had lasik eye surgery a year ago, so his first choice is the eye doctor that performed that surgery. Except – this is the day, no one is in that office. 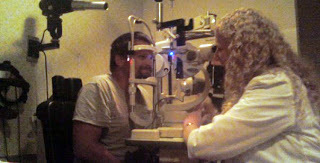 Second choice is Dr. Pearson, the eye doctor he saw pre-lasik when he wore glasses. Her receptionist says the schedule is full today, but come on it, “We’ll squeeze you in.” During the twenty mile drive (almost back to church) Jerry’s eye continues to feel worse. I multi-task again – driving and praying. Dr. Pearson is exactly what you want an eye doctor to be – calm, steady and thorough. Drops to numb the eye give Jerry some relief as Dr. Pearson prepares her attack. Then lights, equipment and action – which includes flipping his eyelid inside out (no, I don’t look, remember Miss No-Nurse here) and ten minutes after sitting in her chair, Jerry is all smiles as the pest is gone. Dr. Pearson shows us the culprit. My eyes are good – but I can hardly see the tiny sliver of ‘something’ on her swab. It is just a speck! I’m amazed that tiny thing caused Jerry so much pain. His vision is fine, but she orders a nap (he’s a happy man!) and says in a day or two the scratches will be healed. As I watch the process – I can’t help but think of other specks. Specks that annoy me in life, but instead of getting someone to help me, I try to fix them on my own and/or I stuff them. Jerry didn’t have that choice today. He tried briefly to deal with the speck on his own by blinking and rubbing his eye – probably causing a few more scratches in the process – but he soon realized he couldn’t fix it. The speck was only removed after he asked for help. Yes, he still needs some recovery time (snoring on the couch as I type 🙂 but the culprit is gone. Do I have any specks that are annoying me? Specks that if removed quickly won’t cause much damage, but if not removed, could cause me more pain … or worse, to lose my vision? Thank you for being such an inspiration. I look forward to reading your book when it's published. You are going to reach the minds and hearts of many people who need to hear what you have to say. Do I have any specks that need to be removed? Yes I do. Thank you for helping me acknowledge that. Now I need to make the change. Wonderful connection between tangible and intangible specks. Thanks for posting.